The ancient practice of meditation—particularly mindfulness meditation—has recently surged in popularity. In fact, in the U.S. about 8 percent of adults and 1.6 percent of children have tried italready. This is because the health benefits of mindfulness meditation are incredibly impressive … and supported by scientific studies. Meditation is the ancient practice of connecting the body and mind to become more self-aware and present (1). Most techniques emerged from a religious or spiritual context, but most now practice outside of these traditional settings. Mindfulness is a specific approach that can be used alone or with other meditation techniques. It's most commonly defined as "paying attention in a particular way, on purpose, in the present moment, non-judgmentally." Mindfulness meditation is the most well-studied in health research. Scientific literature may also refer to it as Mindfulness-Based Stress Reduction or Mindfulness-Based Cognitive Therapy, which are types of mindfulness training. I'll refer to it as mindfulness in this article from here on. Summary: Mindfulness is a form of meditation that is the most well-studied in health literature. It's an ancient practice that emphasizes presence of mind and focus. Mindfulness appears helpful in a wide spectrum of health conditions. It's not understood why, but stress reduction appears to be the common link. 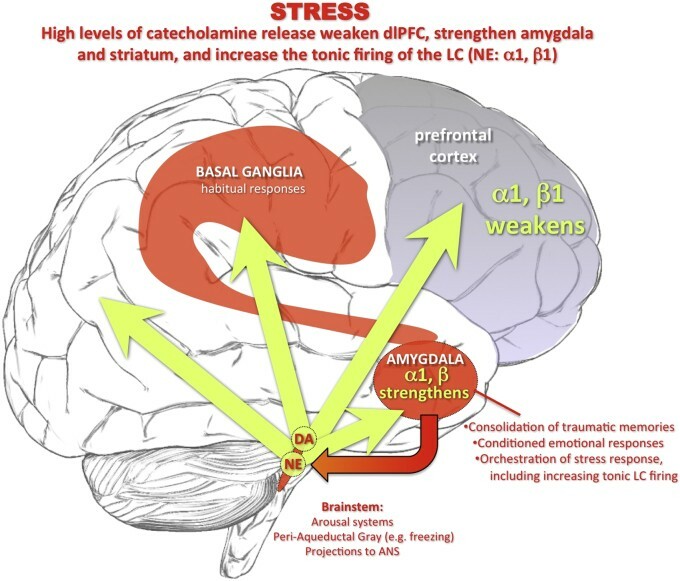 Stress is associated with decreased activity in the prefrontal cortex, thought to be problematic. Mindfulness allows for conscious thinking in the prefrontal cortex, which may reverse this pattern of brain activity under stress (2). It makes sense then that those who regularly practice mindfulness tend to have lower levels of the stress hormone cortisol. At least, that's what early research indicates (3, 4). For these reasons most experts suspect the ability of mindfulness to reduce stress is the key reason to its benefits. Summary: Mindfulness appears to reduce stress and markers of stress. This is important as many health conditions are worsened by stress. Mindfulness has a direct effect on mental health. Evidence is strongest for anxiety (General Anxiety Disorder) and depression, two of the most common mental health conditions worldwide. Anxiety causes chronic, excessive, and often uncontrollable worry. Unfortunately up to 60% of patients do not improve with conventional treatment, such as medications and psychotherapy(5). Studies show mindfulness can help. In one clinical trial of 89 patients with anxiety, one group undertook an 8-week Mindfulness-Based Stress Reduction program (MBSR), while the other group received 8 weeks of stress management education. Members of both groups who participated in just one or more sessions showed symptom improvement, assessed by the Hamilton Anxiety Scale. However, the MBSR group showed much greater improvement than the stress management group when additional anxiety symptom scales were used (5). 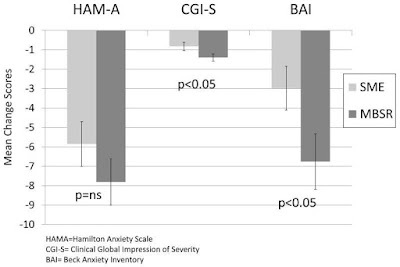 Change in symptom scores for three anxiety measures after Mindfulness-Based Stress Reduction. The lower the number the better. Other studies have found similar benefits, particularly when mindfulness is used alongside anxiety medication (6). Clinical depression is complex disorder characterized by low mood and avoidance of usual activities. Conventional care includes medication and psychotherapy. Unfortunately, many patients relapse with this protocol or are do not comply with medication regimens (7). Research suggests that mindfulness can help prevent relapse for those who do not wish to use maintenance antidepressants. One group of 28 patients with major depressive disorder in remission received maintenance antidepressants. The second group of 26 patients gradually discontinued antidepressants while receiving an 8-week Mindfulness-Based Cognitive Therapy (MBCT) program. The third group of 30 patients gradually discontinued medications while receiving placebo pills under clinical supervision. 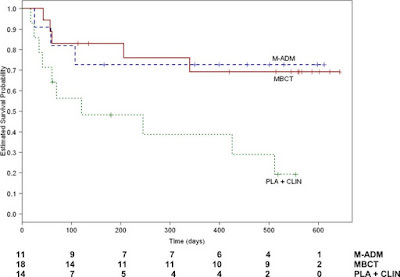 Compared to the placebo group, the mindfulness and antidepressant groups showed equally reduced likelihood of relapse. Keep in mind the mindfulness group were weaned off antidepressants. Proportion of unstable remitters who survived without relapse during maintenance/follow up. 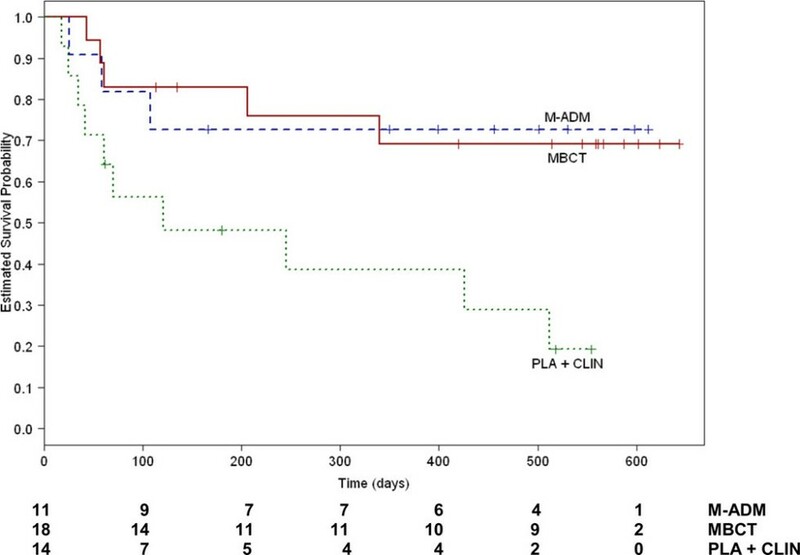 M-ADM = maintenance antidepressant pharamacotherapy, MBCT = taper + Mindfulness Based Cognitive Therapy and PLA+CLIN = taper + pill placebo and clinical management. Data from several studies suggests mindfulness and antidepressants are comparable for treating mild to moderate symptoms of depression (8). This certainly does not suggest those with depression should discontinue medications. However, mindfulness does show promise as an alternative, and certainly as therapy alongside antidepressants. Summary: Studies indicate it's useful for managing anxiety compared to conventional stress management practices. It may also be an effective alternative to antidepressants for those at risk of depression relapse.